Since Y Combinator’s appearance in 2005, accelerators have been viewed all over the world as magical catapults for taking tech startups to the next level. But are accelerators the silver bullet solution to turning a city, region, or country into the next Silicon Valley? Can they bring traditional companies into the new wave of rapid-paced innovation? Accelerators are one of the most critical support mechanisms for startups, which have become a critical element of innovation systems across the world. The technology-led “democratization of innovation” has allowed startups to disrupt all type of markets and to compete with larger established companies. Countries, regions, and cities are competing to become leading startup hubs. Companies are looking for mechanisms to connect with startups and adapt to the new startup pace of innovation creation. Successful startups, however, do not exist in a vacuum; they need an enabling ecosystem with an efficient support infrastructure. Our research revealed that accelerators have a critical role in startup ecosystems, providing two fundamental functions. First, accelerators create a base layer of startups, which forms the critical mass for an ecosystem’s development and growth. We found that, on average, startups participating in an accelerator program in the ecosystems we analyzed significantly increased their chances of securing investment funding for the first time. 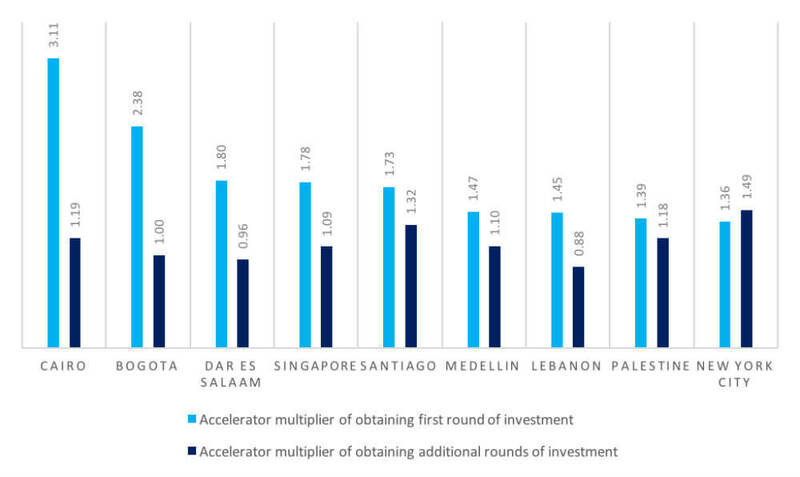 In ecosystems beyond a very initial phase, but still maturing, such as Cairo, Medellin and Beirut, the chances accelerated startups get first funding is two to three times more than unaccelerated startups (see the first chart below). By contrast, when we looked at other types of support programs such as incubators and training workshops, we did not see any substantial increase in startups’ odds of obtaining funding. Second, accelerators are central to building the community of entrepreneurs, which is the core of every startup ecosystem, by forming clusters connecting entrepreneurs with mentors, knowledge, and resources, including investment funding. Contrary to common belief, however, we also found that accelerator programs have a poor record creating sustainable startups beyond the first round of funding. When we looked at startups that obtained more than one round of funding, the impact of accelerators was generally lower or even negative, meaning chances of getting additional funding among startups in accelerator programs is lower than those who aren’t part of the program (see below). Only in those ecosystems with more advanced and sophisticated international accelerators, such as New York and Santiago, do accelerator programs have a substantial positive impact on sustainable startups beyond the first round of funding. Accelerator program multipliers of obtaining investment funding: first round, and more than one round. Number above one shows the higher probability of startups getting more funding if they attended an accelerator program. Number below one shows lower probability of that happening. Why does this happen? We combined our quantitative research with qualitative research and conducted interviews to startups and accelerators in all ecosystems in our study. We found the performance of accelerators varies. Accelerator programs do not seem to be a silver bullet solution. Setting up an accelerator is not enough. To be successful, these programs must provide experienced mentorship, connection to meaningful networks of expertise and funding, and a quality practical training model. Only a few accelerators achieve this level of quality. Quality accelerator programs are less common in less developed ecosystems. Often, homegrown programs in these countries do not have access to the experienced talent, knowledge, and mentors needed for their success. Accelerators nevertheless can play a critical role in creating and sustaining startup ecosystems. In addition, they build communities of entrepreneurs and networks to connect them to talent, mentors, and funding. These networks go beyond the accelerator’s cohort of startup founders and expand through the ecosystem, creating foundational building blocks. Accelerator programs typically organize events, competitions, hackathons, or even have co-working spaces and skills programs open to the broader community of entrepreneurs. In essence, accelerators act as the glue, connecting different clusters of ecosystem’s stakeholders and providing entrepreneurs with connections to knowledge and resources. When we analyzed the social networks of startup ecosystems, we found that accelerators have the highest centrality measures compared to any other ecosystem stakeholder studied. This is a critical role in mature ecosystems. Without these networks, ecosystems are ineffective in connecting the ideas, entrepreneurs, and resources required for successful startups. Accelerators’ role as super-connectors is not limited to their local ecosystem. Accelerators also connect ecosystems to each other, allowing entrepreneurs in less advanced ecosystems to access the talent, mentors, and funding networks unavailable domestically. Interconnection between ecosystems is critical in less mature ecosystems which cannot provide the quality mentorship and funding needed for their startups to compete internationally (see the figure below). High-quality international accelerators connected to global networks of mentors and investors (e.g., Y Combinator, 500 Startups, Techstars, NUMA, Rock Stars, Seedstars and Startupbootcamp) are effective tools for less developed ecosystems to grow and become internationally competitive startup hubs. Sample of three international accelerator programs’ (Techstars, 500 startups and Seedstars) role of super-connectors among startups and resources among different ecosystems. Startups are represented by color dots. Each color is a different ecosystem. Gray color dots represent stakeholders (e.g., startups, investors) operating in more than one ecosystem. This map follows a gravitational analysis based on strength and quantity of connections. The closer the dots are, the stronger the connectivity these startups and stakeholders have. Note: The Bogota and Medellin ecosystems did not show any connection with any of these three programs within our data sample. As competition among startup hubs increases globally, it is critical for countries to build innovation-led competitiveness by creating high-quality domestic accelerators that can produce a critical mass of sustainable local startups and attract super-connected international accelerators to access global networks of knowledge and resources. *This article is based on the findings of the research we conducted in the following nine startup ecosystems: Beirut (Lebanon), Bogota (Colombia), Cairo (Egypt), Dar es Salaam (Tanzania), Medellin (Colombia), New York (USA), Santiago (Chile), Singapore and Palestine. The team working on this research includes Victor Mulas, Kathy Qian, Anastasia Nedayvoda, Matt Lerner, Scott Henry, Erick Murillo and Nga Nguyen. We collected data of over 8,000 stakeholders (e.g., startups, investors, support programs) in these ecosystems. The data collection process is part of the Global Entrepreneurship Research Network (GERN) Ecosystems Connections Mapping project. Examples of ecosystems report analysis can be accessed for Beirut (Lebanon) and Dar es Salaam (Tanzania). For this research we considered “accelerators (PDF)” to be startup support programs that provided upfront investment, had a competitive application process, cohort-based intensive mentoring, and a duration of two weeks or more with a graduation date (i.e., program is limited in time).